Leading Online Jewelry Retailer Danforth Diamond announces the addition of their newest jewelry collection for mothers: The Moppets® from Haute Corporation. Midlothian, VA May 6, 2009 — Leading Online Jewelry Retailer Danforth Diamond announces the addition of their newest jewelry collection for mothers: The Moppets® from Haute Corporation. Each of the 20 different characters in the charm collection is available in gold or silver; and each has its own name and personal story. They make great gifts for Mother’s Day, or any day, and are perfect for adding to a charm bracelet or hanging from a necklace. In keeping with Danforth Diamond’s commitment to help preserve our planet’s future each of The Moppets® is made from 100% eco-friendly Harmony Recycled Precious Metal™. The creators of The Moppets® will NOT play a role in the Earth’s destruction just to create beautiful jewelry. 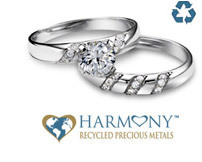 Instead they choose to help preserve the planet by creating their product line from the HARMONY brand of recycled metal jewelry. “We are excited to offer these adorable charms to our customers! Every mom and grandmother will love them,” said Jill Renee, President, Danforth Diamond. Danforth Diamond has expanded their collection of fine jewelry with the addition of the Obama bracelet. With the words “Yes We Can” etched into the bracelet, it commemorates the 2009 inauguration of the 44th president, Barack Obama, and honors this historic moment. Danforth Diamond’s “Yes We Can” Obama 2009 Bracelet is a stylish cuff and comes in 14K yellow gold, 14K white gold, or sterling silver. It is offered in women’s size (7-inches) or men’s size (8-inches). Understated and elegant, this bracelet is a discreet way to mark this historic moment and show your support. Danforth Diamond is a leading online jeweler specializing in diamond engagement rings and wedding bands. Their jewelry collection features silver and gold bracelets, necklaces and earrings with options to fit every style and budget. Visit Danforth Diamond online to learn more at: www.danforthdiamond.com. Midlothian, VA â€“ (PRWeb) â€“ February 15, 2008 Danforth Diamond, a leading provider of diamond engagement rings, is proud to announce the addition of 3D view for their engagement rings to allow for an enhanced buyer experience. As more and more buyers are deciding to purchase their wedding rings and diamonds online, the demand to know exactly what they are buying is growing. While some companies have created digital 3D representations of their rings, Danforth Diamond has created 3D images of their actual rings.Â No digital representations. With twenty of their most popular diamond engagement rings, and more to come, Danforth Diamond has placed themselves on the cutting edge of online ring sales.Â With this move they hope to provide a service that is appreciated by both their loyal customers and the new ones they gain every day. Danforth Diamond is a leading online provider of diamond engagement rings, wedding rings, diamonds, and other jewelry.Â Their selection of white gold, platinum, and palladium engagement rings is unrivaled and offers options to fit every style and budget. Visit Danforth Diamond online to learn more at: http://www.danforthdiamond.com . By replacing the nickel or silver traditionally used to make 18K white gold with palladium, Danforth can now offer superior quality without the fear of the common nickel allergy that drives many customers away from white gold, creating another option for their valued customers. Long used by jewelers as a substitute for Platinum, Palladium jewelry came to prominence during World War II when Platinum was reserved for military uses. As it bears many of the same properties, but not the price-tag, usually associated with Platinum, Palladium was an excellent option for top quality jewelry instead of Platinum. By adding Palladium to yellow gold, jewelers are able to produce white gold that holds the white coloring better and longer than that made with nickel or silver, and helps avoid metal allergies usually associated with nickel. The addition of Palladium to select wedding bands and diamond engagement rings is why Danforth Diamond continues to be the jeweler more people prefer. This announcement is another in Danforth’s long line of meeting their customers’ demand for high-quality jewelry. Danforth Diamond plans to continue offering the high-quality products their customers appreciate through their site at: http://www.danforthdiamond.com/ . Danforth Diamond has over 50 years of experience offering quality jewelry for the best value. As experts they provide guidance and advice to help you enjoy the diamond purchasing process, and are known for their wedding jewelry, including platinum, palladium, yellow gold, and white gold engagement rings and matching sets. They are committed to your continued satisfaction. Palladium, a metal in the platinum family that is just as durable as it’s more expensive cousin, is the hottest new metal in the jewelry industry. Scott Kay, a master jeweler and authority in the industry, is calling palladium ‘the industry’s best-kept secret. Danforthdiamond.com decided to specifically create the world’s largest collection of palladium engagement rings because of growing customer demand. For most brides, this is the one piece of jewelry in their collection that needs to be able to endure a lifetime – and palladium’s durability makes it an attractive alternative to other metals. “The new palladium alloys used for engagement ring manufacturing are excellent and make this a hard option to beat when choosing metal for that perfect ring,”says Jill Renee, president of Danforthdiamond.com. That’s why we have expanded our selection of palladium engagement jewelry. Customer demand encouraged Danforthdiamond.com to become a leader in offering palladium wedding jewelry. Every category of engagement ring offered on the site: solitaires, three-stone rings and rings with side stones has a palladium option. Matching engagement ring and wedding band sets are also available. With more than 50 years in the jewelry business, Danforth Diamond is an online fine jewelry retailer. Their site offers high quality palladium engagement rings and wedding bands as well as earrings, bracelets, necklaces and rings in gold, white gold and platinum at competitive prices. View their collection of palladium engagement rings. Richmond, VA Ã¢â‚¬â€œ January 2, 2006 Ã¢â‚¬â€œ DanforthDiamond.com, an online diamond jewelry retailer committed to offering conflict-free diamonds, recently joined StopBloodDiamonds.org. For information about Danforth Diamond or to see their conflict-free diamond jewelry, visit: http://www.danforthdiamond.com. Danforth Diamond announces price reductions on their entire collection of sterling silver jewelry in time for Mother’s Day. Now through May 14, 2006 all sterling silver bracelets, earrings, necklaces, and key rings are an additional 25% off the already-low Danforth Diamond price. Please visit to view some of their featured Mother’s Day Jewelry. Shopping online offers consumers the ability to compare products and prices with a click of their mouse. Danforth Diamond jewelry is already 40% off the retail prices found in jewelry stores and further reducing the sterling silver collection represents a significant savings for Mother’s Day gift buyers. Jill Renee, president of Danforth Diamond, explains, “Having a Mother’s Day sale is a way to help people find the right gift for mom. We want to reward our loyal customers and introduce new customers to Danforth Diamond. The sale has been in progress since mid-April and has received positive feedback from returning customers as well as first-time buyers. “Our quality jewelry at competitive prices attracts Mother’s Day gift buyers and our helpful customer service is what makes them repeat customers, Ms. Renee says.